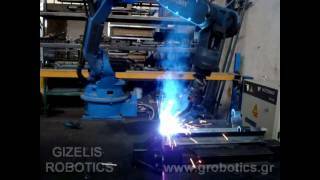 Welding is one of the most fundamental applications of industrial robots. Quality offered in conjunction with speed represents the main reasons for their utilization. Moreover, finding adequate welders nowadays seems to be very difficult since welding is a dangerous procedure (high radiation, gas emissions etc) and may cause health problems (sight abnormalities etc). Robots undertake the “dirty” work since they ceaselessly and tirelessly execute tasks usually carried out by humans, providing end products with the quality required to stand out. 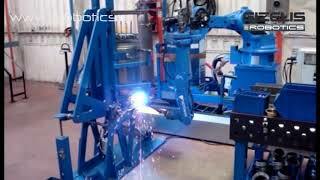 The qualities of a robot are manifest when it comes to welding. They are extremely precise and faultlessly maintain a steady pace when moving, offering consistency and utmost quality to end products. 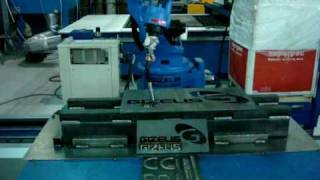 They may also work together with the welding machine and adjust its parameters during welding thus adding quality even in the case of difficult-to-handle materials (e.g. aluminium). Robots may also manipulate external axes and expand their work envelope, and thus facilitate welding in difficult parts of pieces. Also, by means of a positioner, the system acquires increased flexibility and registers huge increase in productivity. 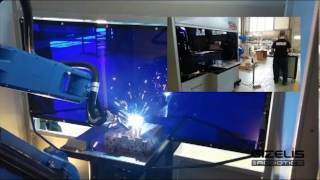 As per robotic applications for welding, there are specific welding machines (MIG/MAG, TIG) that feature real-time machine-robot communication. The robot may change its parameters or select one of the machine’s preset programs (depending on the machine’s controller type). There are also the automatic wire feeder located on the robot for its proper feeding, the welding pincer and the automatic pincer cleaner that guarantees consistent welding quality even after many hours of operation. 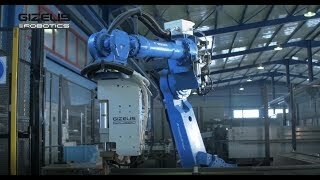 The type of machine, welding pincer and feeder must be selected according to welding details (gauge of materials to be welded), temperatures that will occur (liquid or air-cooled pincer), wire feed speed (single or double pincer) and mounting type on the robot (inside or outside cabling). One additional component used is a shock sensor, which ensures that the robot will stop in case of collision with another part (e.g. the worker leaves a gauge stopper open by mistake). 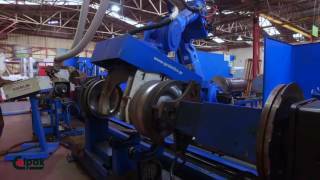 Another feature of these robots is that they can control the welding pathway by means of special sensors, since it varies when it comes to big pieces. Lastly, they deliver numerous waving templates so that the filler may take less sessions to apply, thus providing a magnificent outcome.